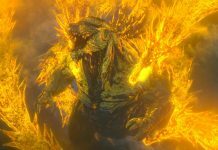 Netflix has released Godzilla: The Planet Eater aka Gojira: Hoshi o Kuu-mono worldwide to bring the animated Godzilla trilogy to a close. The film finally provides a clash of monsters, but it won’t win over any fans unhappy with the previous chapters. The first two films started with a desperate situation, but this time it begins with a more personal desperation as events close in on Captain Haruo Sasaki. Godzilla is put in the background, both literally and figuratively. The focus is the relation of the characters and the pressures on Haruo. Picking up where the last film left off, the survivors of the MechaGodzilla City battle have regrouped with the Houtua people. 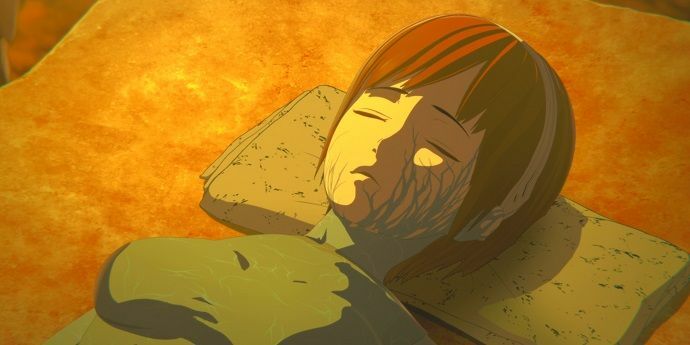 Haruo’s childhood friend, Yuko Tani, is found to be brain dead. The attempt to save her from the MechaGodzilla’s nanometal was a failure and stopping Godzilla seems hopeless. 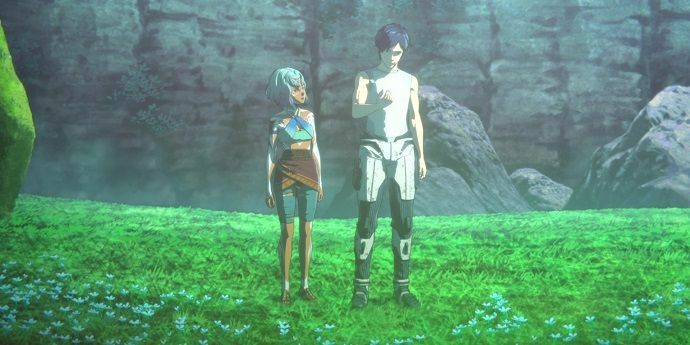 Haruo is caught between the politics of humans and Bilusaludo aliens back on the ship Aratrum. The Bilsueado call for Haruo to be arrested for treason after he destroyed the MechaGodzilla control. 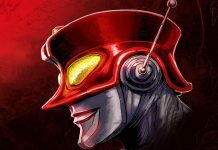 Back on Earth Metphies deceitfully encourages his human followers to believe that it is a miracle of god that Haruo survived MechaGodzilla City and the nanometal. Finding himself to be a cult figure, Haruo becomes more isolated from the group. Godzilla spends most of the film as a sleeping giant. The revelation that Metphies has been orchestrating events was long hinted in the previous entries, but a brief pre-title screen prologue removes any ambiguity about his motives. It sets a precedent of film often telling the viewer, instead of showing. Haruo escapes with the Houtua Miana. We get a quiet scene where the characters get philosophical about winning and losing. 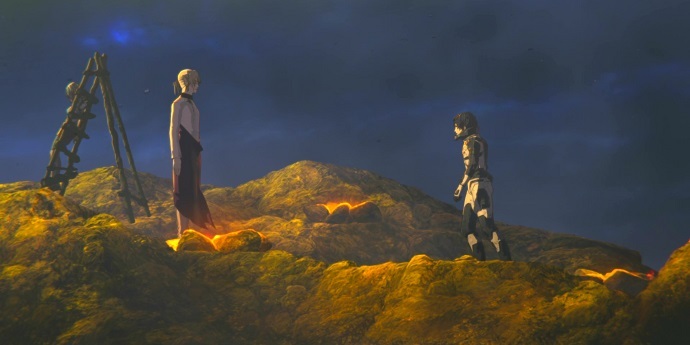 Suddenly, Miana makes an advance towards Haruo, which he declines. Later, Miana’s twin, Maina comes to care for Haruo. Haruo realizes it was she who initially saved him from the events of the first Godzilla battle. He then accepts when Maina offers herself to Haruo. 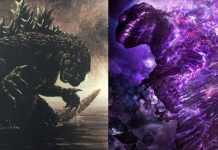 There is very little in way of intimacy in the Godzilla series, so it was definitely unexpected. The whole sequence feels a little like it falls into an anime stereotype. There is nothing really risqué here or explicit, but it’s certainly surprising. One of the most anticipated aspects of The Planet Eater was how King Ghidorah would be handled. The film provides a re-imagining that works well; bringing a sense of dread and cosmic horror. 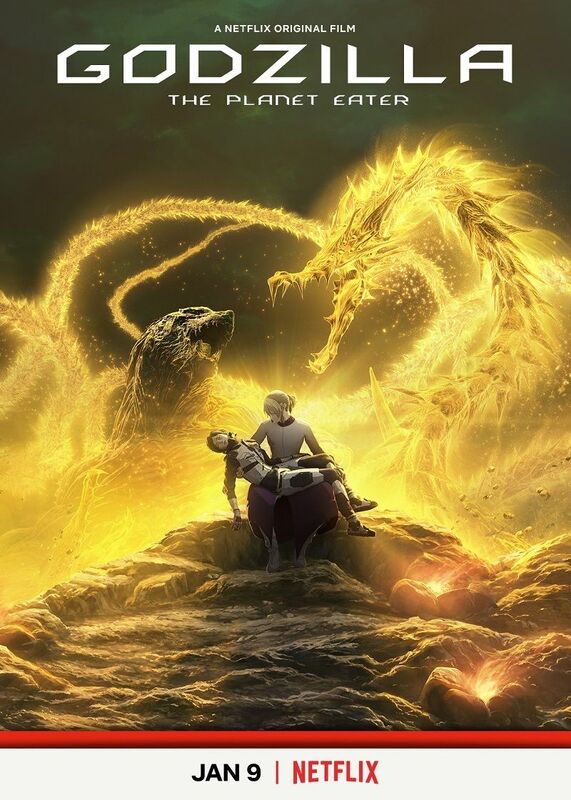 Ghidorah is conceptualized as it could come out of the pantheon of Lovecraft’s Elder Gods. Enter the Dragon: Ghidorah emerges from the void. 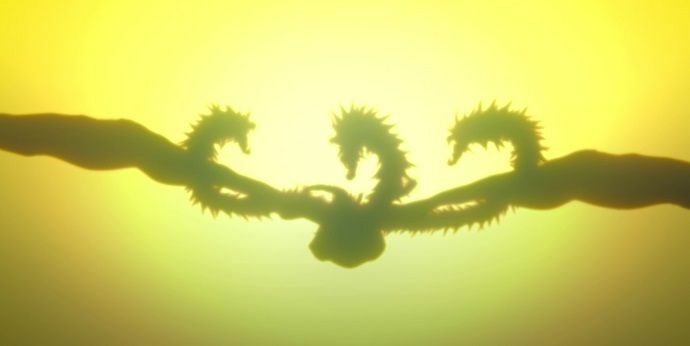 Ghidorah is a creature of the void which can bend gravity and warp time. The monster’s true form is only glimpsed at in a vision, but it manifests itself at three serpentine heads, each emerging from singularities. There are touches of horror as Metphies and the Exif priest aboard the Aratrum start their prayer to summon Ghidorah. The human followers are killed by a three-headed shadow, learning only in their final moments that the Exif religion is actually a death cult. 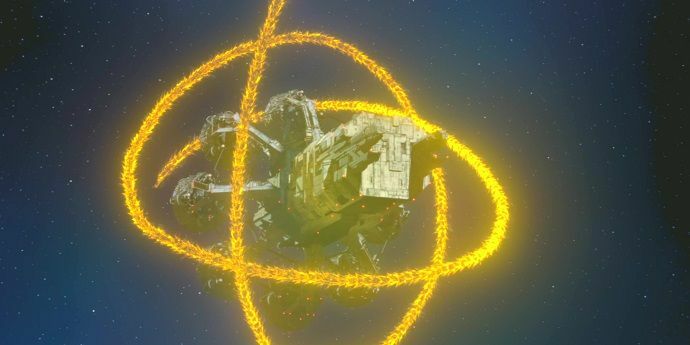 When Ghidorah attacks the Aratrum, warping the laws of time and space, there is a great moment where the crew realizes that they are dead before it happens. The final moments of the Aratrum. The destruction of the Aratrum finally awakens Godzilla, but the great monster is helpless as Ghidorah descends to Earth. 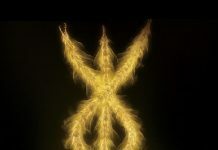 Ghidorah is a phantom; it is intangible, yet it can inflict physical damage and absorb Godzilla’s power. 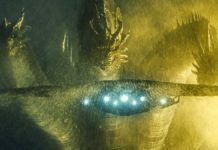 While this incarnation of King Ghidorah is a great interpretation, the limited screen time is disappointing. 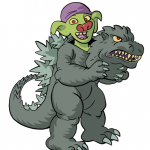 After grappling Godzilla, both monsters are shuffled to the background. Can’t Touch This: Godzilla is powerless against Ghidorah. 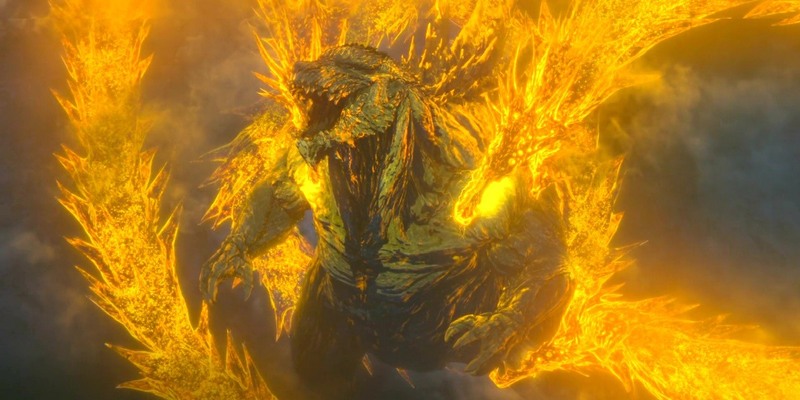 The real climax is not Godzilla and Ghidorah’s battle, but Haruo’s internal struggle whether to save Earth or destroy Godzilla. Metphies puts Haruo into a trance and tries to convince him to willingly offer himself to Ghidorah. This would allow the monster to consume the planet. Haruo must evaluate all the sacrifices he has made to stop Godzilla and decide his true purpose. There are revelations about how far back Metphies has shaped Haruo’s life for this exact moment, putting the events of the previous films in a new light. One shall stand, one shall fall. There will be a lot of talking before that, though. 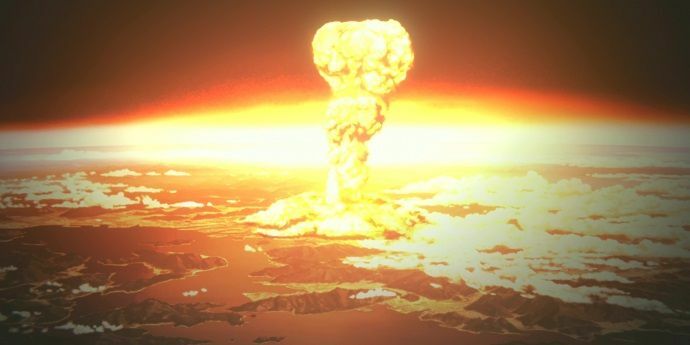 The film uses imagery of Hiroshima and the Enola Gay, bringing in the traditional Godzilla metaphor. The idea presented is that essentially all races of the universe will eventually create their own destruction (i.e. their own Godzilla). This is mixed with a Lovecraftian fatalism of the Exif religion/philosophy. 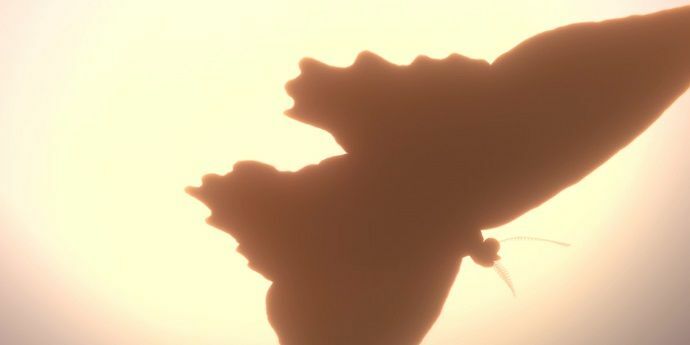 While it should not be much of a surprise, the long hinted at Mothra does not physically appear in the film. Maina sends Mothra as a kind of psychic projection to help Haruo break free of the illusions. Mothra has a more traditional depiction here and actually a pivotal, albeit very brief, role. By allowing Haruo to defeat Metphies Ghidorah is brought into a physical form. Float like a butterfly, sting like an astral projection. Viewers wanting an epic monster smack-down will be sorely disappointed, but Godzilla does finally get to fight back. It’s a little strange that Godzilla’s origins based on the atomic bomb were only brought up in this film. The timeline suggests Godzilla’s first appearance would have been long after the bomb testing of the 1950s. For a film series that presents some radical departures, it feels odd that they would suddenly go back to tradition at the end. It feels like a tacked-on afterthought. 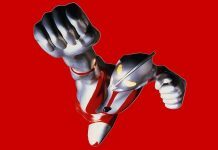 Co-Director Hiroyuki Seshita mentioned that Toho asked them to avoid the monster fights of the 60s and 70s and bring a serious tone. 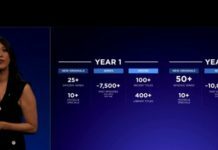 The idea was to broaden the brand, especially to a female audience. 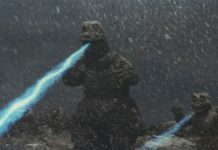 A lack of traditional monster fights can be a problem for some fans, but the approach explains the character-driven nature of the films and some of the choices. 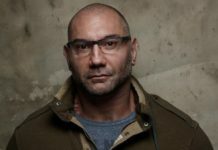 The initial premise came off as Battlestar Galactica meets Godzilla, and in a way, the ending has a bit in common with the ending of the rebooted television series. There were a lot of ideas about destiny, self-determination, religion and free will. Maybe these ideas could have been better fleshed out in as a television series instead of the trilogy of films. Then again, the story may have worked better as just one or two movies. Overall Planet Eater is a satisfying end chapter. It does have some interesting ideas, even if it comes off being a little too ambiguous at times. Some of the themes do end up being a little too on the nose. Haruo experiences spring. “Haru” in his name means “spring.” Really makes you think, doesn’t it? The ending mirrors the original 1954 Godzilla with “sacrifice for sake of humanity” ending, but it is also a bit open-ended (and there is still a post-credits scene for this one). 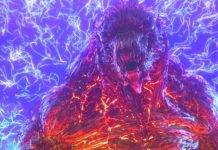 While this animated experiment has concluded, there is no question about the future of Godzilla’s cinematic reign. As Godzilla enters into his 65th year there will be plenty of things to come for long-time fans who wanted more. 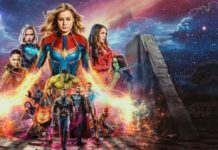 Hopefully, these recent films will bring in some new fans as well. 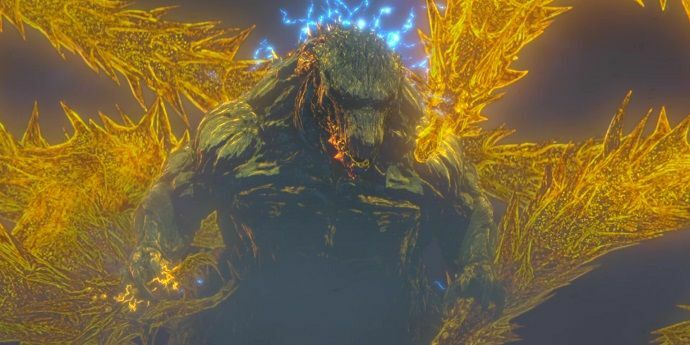 With strange aeons, even death may die, but the Godzilla franchise just sometimes gets strange.